When you have charming little places like Cafe Bistro Buee closing on The Side and being replaced with nasty dirge like “Tasty QFC” – it’s encouraging to see someone making a go of it on the Quayside. A flagship street for Newcastle should be filled with brilliant places to eat, and not just a stag/hen party thoroughfare. Love: the pies. We’ve been through most of them: steak, beef mince, spiced mutton – they tick all the good pie boxes. You get no soggy bottoms, and rich tasty fillings with plenty of meat – these are gonna be satisfying hungry bellies ‘til the end of time. The pies actually come from the accurately named The Amble butcher – so expect consistency, and a certain safety knowing the meat is from local farms, not a stable, and cooked by a good ol’ butcher. Love: the quality drinks selection. The usual suspects – Wylam, Allendale, Mordue are here, but a selection of great beers & ales is backed up by breweries from further afield. It’s the kind of place where you can do a lucky dip at the bar and always get a winner. Like: the pub itself isn’t gonna win any awards for interior design originality, but is a mutli-roomed affair in a very old building. There’s a cellar-like cubby hole of a room playing host to live bands, a warm fire to lounge out at, and at the window seats, one of the best views of the Tyne in the city. Like: pie accompaniments. 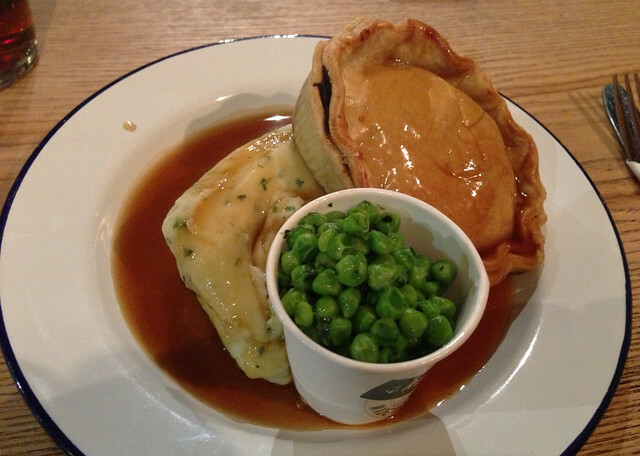 Doggedly sticking to “just pie”, you complement your pastry filled case with a choice of mashes, peas, and gravy. Herby mash, and minted petit pois stand out, though we’re yet to give the traditional parsley liquor a go. The meat-based gravy packs just about enough punch but we’d like a bit more of it, and though the specials (mint & lamb, etc.) offer some variety, with such a niche menu – we’d be amazed if in a year’s time they are still doing “just pie”. Pie-themed desserts offered by the Pet Lamb girls are always canny. Bonus point: the chilli infused vinegar. Whack it on your plate to enhance everything. Hate: drinks prices. When you can go to The Broad Chare and get a cheaper round, you know something is wrong. Hope to see this improve as business picks up. As with sister venue Lady Grey’s – if you want prices, you have to ask. So almost true love for the Redhouse. You know you’ll be satisfied with something miles better than a nearby microwaved Wetherspoons pub meal, and cheaper than a premium Broad Chare plate, so it has a canny niche of it’s own on the Quayside. Ideal also for an early start to a night out, or a post drinks snack better than a horse fat kebab or steak bake. We just can’t see people hanging around all night when a pint is always pushing £4 which is a shame. Newcastle Restaurant Week – Good Value?